AAA logo one side, YOUR NAME on the other side... Get personal AND eco with our new mug-for-life, which can be personalised. It'll be harder to lose a mug bearing your name and think of all the cardboard and paper you'll save from landfill with this beauty. 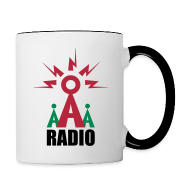 And with every mug sold £2 goes towards radio station fund-raising. CLICK on the MUG to find out more! Every text will cost you one pound plus the cost of your text - so please text as many times as you like! Your donation will help us with the amazing work we do.